I used to be hooked on Seche Vite Dry Fast Top Coat, but what really was annoying about it it seemed to pull my nail polish bottom, sides, and top after hot water... It was ridiculous... And then I also heard that it was toxic, apparently it would be toxic for the embryo, so it's a definite no-no for pregnant women... Pregnant or not I don't want any toxins like that especially when there are products on the market that are half price and work much better! 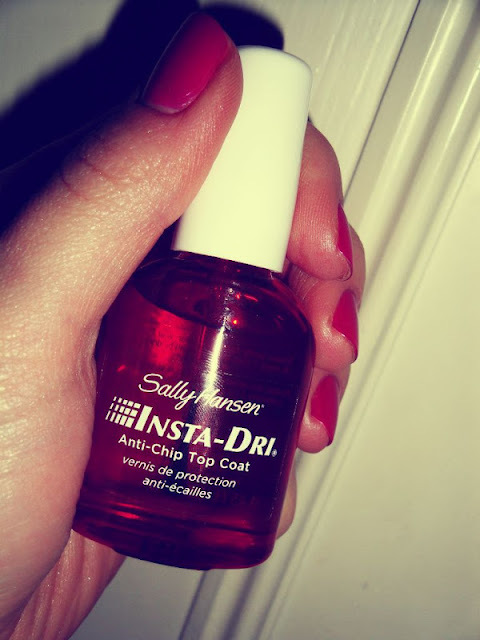 And so after researching I found that many people loved this Sally Hansen Anti-Chip Top Coat... And I think this is my 3rd or 4th bottle now and I really love it... Doesn't do the pulling, dries almost as fast as Seche Vite, nice glossy finish and none of those toxins, it's a yes for me!